Water supply pipelines, water kiosks, pump station, transmission pipelines, electric installation and 48,000 litre water reservoir. Kiboga District is amongst the largest districts of Uganda with a population of about 270,000. The access to safe water in Kiboga stands at 53%, falling below the national average of 58% and in Bukomero Sub county, it falls further down to 40%. 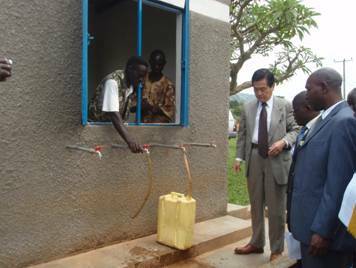 Furthermore, water for the residents of Bukomero Town has been pumped from a contaminated spring, causing health problems. 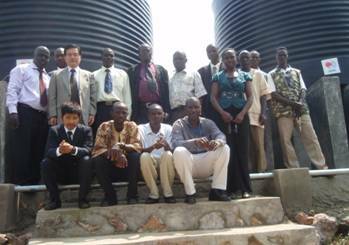 Through this project, a pump station with motorised submersible, transmission pipelines, a reservoir tank and kiosks has been installed to draw water from a deep borehole and deliver it to the kiosks to improve the access to safe water. 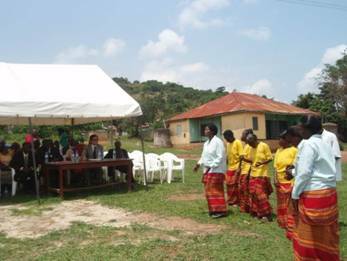 The beneficiaries of this project include the general population of Bukomero Town, the health centre IV, prisons and schools in the sub county. 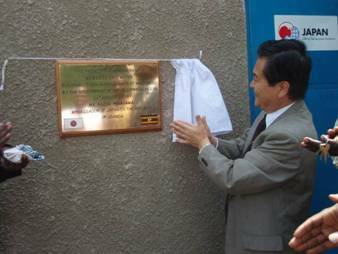 Ambassador Kazuo Minagawa attended the handing over ceremony in Bukomero Town, Kiboga District, 24thAugust 2011.